(Nanowerk Spotlight) Probably the hottest new material system being researched at the moment, graphene consists of just a single atomic layer of carbon atoms bound into crystal lattice. This carbon material reveals many unique properties including extremely high electron mobility and thermal conductivity. The most promising applications of graphene are in electronics (as transistors and interconnects), detectors (as sensor elements) and thermal management (as lateral heat spreaders). An important consideration for practical graphene applications is the fact that the physical characteristics of graphene are strongly dependent on the number of atomic planes, i.e. the properties of few-layer graphene are different from those of single layer graphene. Unfortunately, the one-atom thickness of graphene and its optical transparency make graphene identification and counting the number of atomic planes in few-layer graphene extremely challenging. This complicates the development of industrial-scale applications that would require the handling of large wafers with graphene. Recent progress in chemical vapor deposition (CVD) of graphene points to a possibility of having such large wafers with graphene on an industrial scale very soon (see for instance: "Graphene films clear major fabrication hurdle"). The problem is how to establish a reliable high-throughput method of graphene identification and quality control on a wafer scale to make sure that what you get is really graphene, either single or few-layered, as required. The problem, though, is that current techniques for counting the number of atomic planes in few-layer graphene samples are either destructive, too complicated, or too slow – they are not suited for cheap, fast, accurate and in situ control methods required by industrial applications. "The existing methods of counting the number of atomic planes and verifying graphene properties are all essentially local," Alexander Balandin tells Nanowerk. 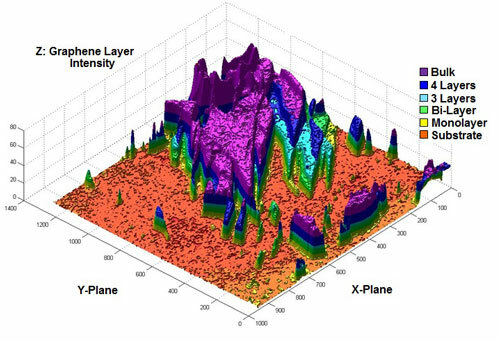 "Micro-Raman spectroscopy currently is the most reliable non-destructive tool for determining the number of atomic planes. Conventional optics inspection of graphene placed on 300-nm thick oxide layer on silicon is not reliable enough and, not surprisingly, only works on 300 nm thick silicon oxide on silicon. For these reasons, there is a strong need for developing a reliable technique for identifying the number of atomic planes in graphene samples on the wafer scale." An interdisciplinary team at the Bourns College of Engineering (BCOE) of the University of California, Riverside (UCR) accomplished just that. Materials Science Chair and Electrical Engineering Professor Alexander Balandin and Distinguished Professor of Electrical Engineering Bir Bhanu combined their expertise in materials and image processing to develop a large-scale graphene recognition and quality control technique for industrial applications. The new method was realized in practice by graduate student researchers Craig M. Nolen, Giovanni Denina and Desalegne Teweldebrhan. The joint efforts of two laboratories – the Nano-Device Laboratory and the Visualization and Intelligent Systems Laboratory – led to the development of an industrial scale, fully automated technique, which allows to scan wafers and determine regions with single layer graphene, bilayer graphene, etc. 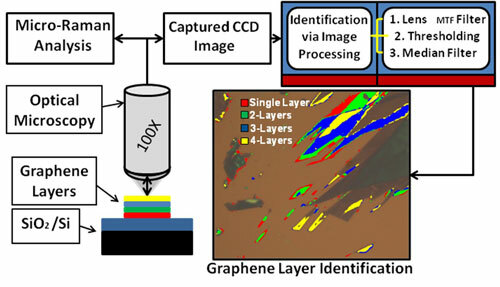 Reporting their findings in the January 5, 2011, online edition of ACS Nano ("High-Throughput Large-Area Automated Identification and Quality Control of Graphene and Few-Layer Graphene Films"), the BCOE team demonstrates a reliable high-throughput method of graphene identification and quality control, which can be used for large-scale substrates and wafers. It is a fast and fully automated approach for determining the number of atomic planes in graphene samples. The procedure allows for in situ identification of the borders of regions with the same number of atomic planes. It is based on an original image processing algorithm which utilizes micro-Raman calibration, light background subtraction, lighting non-uniformity correction, and the color and grayscale image processing for each pixel. 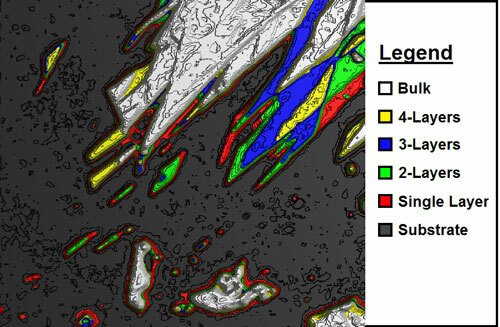 "The outcome of our procedure is a pseudo color map, which marks the single-layer and few-layer graphene regions on the substrate of any size that can be captured by an optical microscope," explains Balandin. "Our approach works for various substrates and can be applied to mechanically exfoliated, chemically derived, deposited or epitaxial graphene on an industrial scale." Balandin tells the story how the idea to combine the expertise of two labs – one in graphene and Raman spectroscopy, the other one in image processing – originated with the graduate students. Craig Nolen, who was performing mechanical exfoliation of graphene, started to talk to his friend Giovanni Denina, who was developing image recognition techniques for different objects. "I was hoping to come up with some procedure, which would make the selection of graphene flakes with the single atomic plane automatic," says Nolen. "I had to do many routine and time consuming tests to separate out single-layer graphene from bilayer graphene and from few-layer graphene. It was hard to establish the exact border line between the single-atomic plane region and few-atomic plane region. I had to do Raman scans again and again. At some point I asked for an advice from Giovanni, and that started cooperation. Our professors were receptive to the idea and they helped, each from his side, to guide the process." The third graduate student, who joined the project, Desalegne Teweldebrhan, had experience with several types of exfoliated materials, including graphene, thermoelectrics and topological insulators such as bismuth telluride (see "Graphene-inspired bismuth telluride atomic layers could revolutionize cooling and topological insulator applications"). He contributed his expertise in using proper light illumination conditions to facilitate the image recognition. "We realized pretty early on that we have to do correction on non-uniform light distribution over the substrate in order to be able to uniquely assign a certain pseudo-color to a given number of atomic planes," says Teweldebrhan. The result of this cooperation is a fast and fully automated technique that allows the identification of number of atomic planes in CVD grown graphene over large areas and in a very short time. The team points out that their method can also be applied to graphene produced by other techniques. Balandin notes that the team knows that its technique works on average-size substrates. "We have demonstrated our technique on the exfoliated samples, which had different number of atomic planes and complicated geometry. Now we want to run the technique on a full-size graphene wafers."